The length-optimized CMP.. servomotors offer precision, high dynamic characteristics and power in a particularly compact design. 7 high-performance sizes cover peak torques up to 320 Nm and can be used in the tightest of spaces. Our CMP.. series of synchronous servomotors can adapt to high loads or to the highest dynamic requirements. Whether in the food and beverage industry or the construction, automotive or wood industries: these synchronous servomotors can be used anywhere to achieve fast cycle times or to move the heaviest loads easily and precisely. Thanks to their optimized length, you can use the CMP.. motors even in the tightest spaces. The highly dynamic CMP.. servomotors round out our range of servomotors: they offer standstill torques of 0.5 Nm to 95 Nm with 7 motor sizes and a total of 31 motor grades. State-of-the-art winding and magnet technology make the servomotors extremely low in inertia, even though they are optimized for performance. The result is a motor system with the highest possible dynamic characteristics. As the largest motor in the tried and tested CMP.. series, the CMP112 rounds out the existing range of highly dynamic synchronous servomotors in the upper part of the power range. With torques of up to 320 Nm. It is optionally available with a “BY” holding brake with an increased working capacity. Only half the solution without a gear unit? Then take advantage of our modular concept and combine the servomotors of the CMP.. series with a servo gear unit and a servo gearmotor of your choice. Or you can just choose a separate servo gear unitthat meets your requirements. thanks to the modern winding and magnet technology – over the entire speed range, of course. thanks to the high-performance rotor of the CMPZ.., even under extreme loads. since different brake systems with scalable braking torques and a manual brake release option are available. because the motor can be directly mounted on a gear unit from our proven modular gear unit system. The synchronous servomotors are up to 30% more efficient than classical asynchronous motors. The permanent magnet means that no resistance losses occur in the rotor. No fan friction is created either because the synchronous motor is not ventilated. Save energy with our CMP series of synchronous servomotors! Our synchronous servomotors create the magnetic field necessary for generating the torque not through induced currents but rather using permanent magnets. Ohmic losses in the rotor are thus completely avoided. In addition, a fan is installed at the B-side of asynchronous motors to provide convection. Our CMP servomotors, on the other hand, never use a fan. Losses due to fan friction and air resistance therefore do not occur. Innovative production technologies and motor designs result in compact synchronous motors. This is because the single-tooth winding makes it possible to achieve a greater effective power with the same volume. This is why leading food and beverage producers who use continuously running motors in their energy-efficient systems rely on our CMP synchronous servomotors. In case of a complete system solution with the modular MOVIAXIS® multi-axis servo inverter, the energy saved by the CMP servomotors is added to the energy saved by the servo controller. 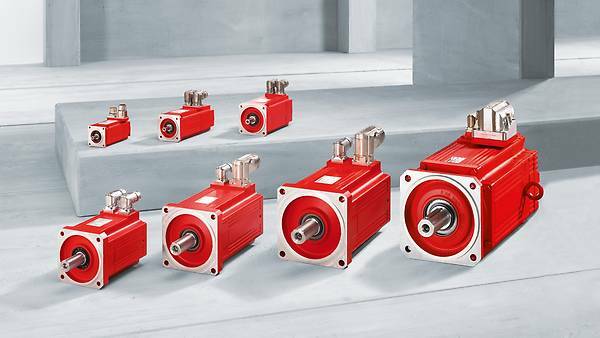 Our synchronous servomotors can be equipped with the safety-rated BY brake and/or with a safety-rated encoder. This is indicated on the nameplate. This is identified on the nameplate with “FS 02” in the FS logo. This is identified on the nameplate with “FS 04” in the FS logo.